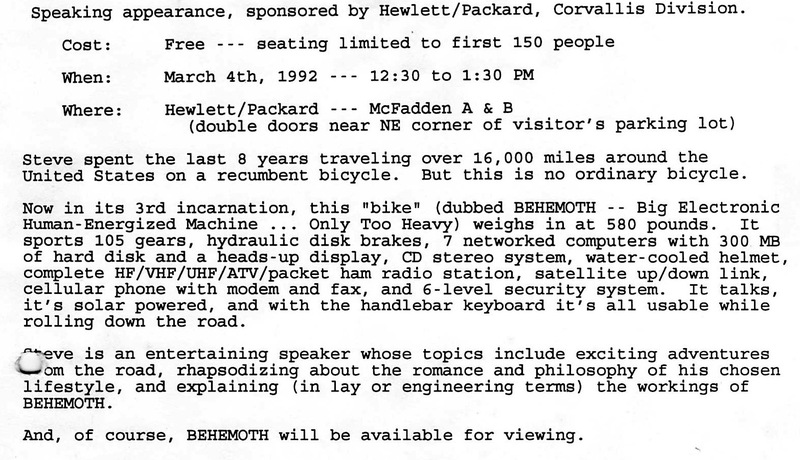 Hewlett-Packard was one of my favorite companies through all the bicycling years, and occasionally my speaking tour schedule would permit swinging by an H-P facility for an on-site presentation to employees. These were always fun, especially in Corvallis… where the exquisite H-P Portable was created. Posters of me with this machine atop Clouds Rest in Yosemite, and at Maroon Bells near Aspen, hung in the halls, and the local media picked up this event in early March, 1992. The photo above is by Maggie Victor. Speaking appearance, sponsored by Hewlett/Packard, Corvallis Division. Steve spent the last 8 years traveling over 16,000 miles around the United States on a recumbent bicycle. But this is no ordinary bicycle. Now in its 3rd incarnation, this “bike” (dubbed BEHEMOTH — Big Electronic Human-Energized Machine … Only Too Heavy) weighs in at 580 pounds. It sports 105 gears, hydraulic disk brakes, 7 networked computers with 300 MB of hard disk and a heads-up display, CD stereo system, water-cooled helmet, complete HF/VHF/UHF/ATV/packet ham radio station, satellite up/down link, cellular phone with modem and fax, and 6-level security system. It talks, it’s solar powered, and with the handlebar keyboard it’s all usable while rolling down the road. 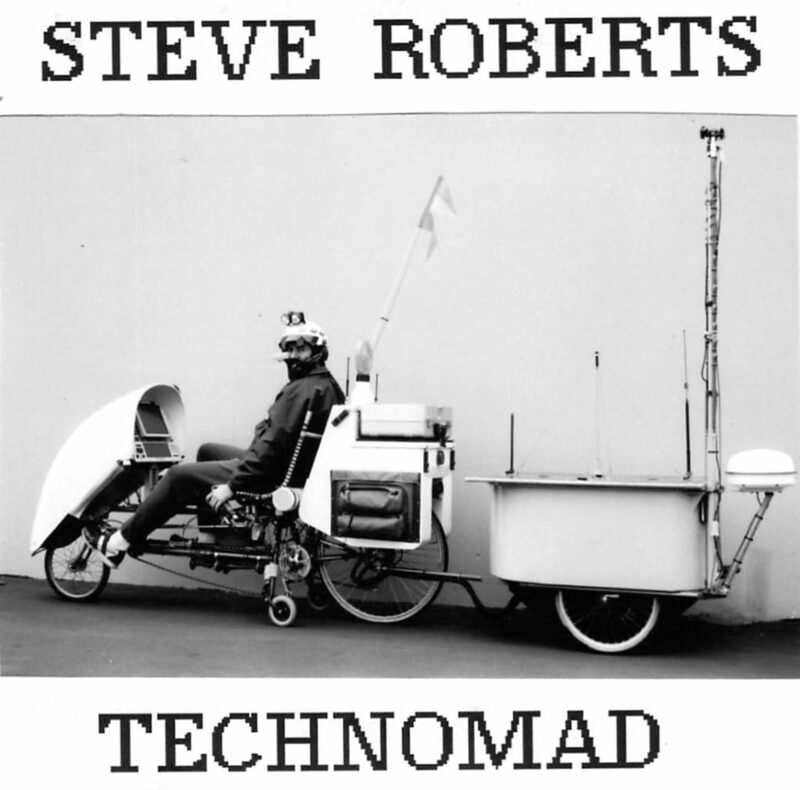 Steve is an entertaining speaker whose topics include exciting adventures from the road, rhapsodizing about the romance and philosophy of his chosen lifestyle, and explaining (in lay or engineering terms) the workings of BEHEMOTH. And, of course, BEHEMOTH will be available for viewing.